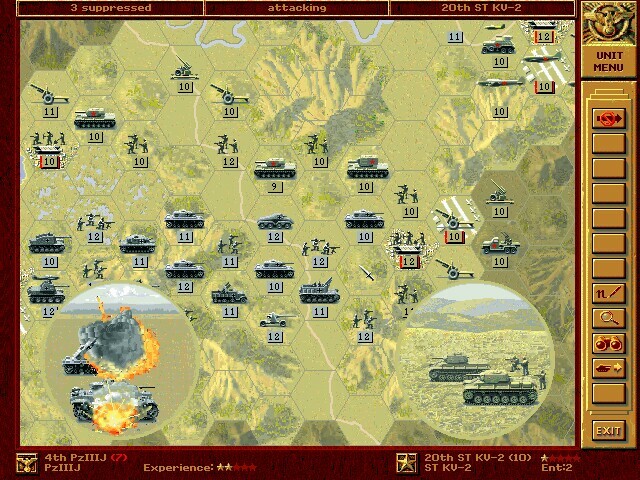 The Generals series, which began with Panzer General, is hailed as the best wargame series produced by S.S.I. 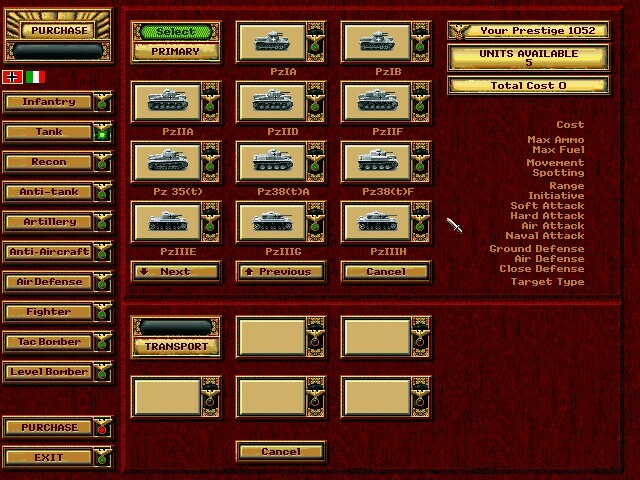 Panzer General possesses magnificent graphics for a wargame of 1990s vintage. The units are easily recognized thanks to the special attention given to detail, and the strategic maps where the forces advance from are of impeccable quality. 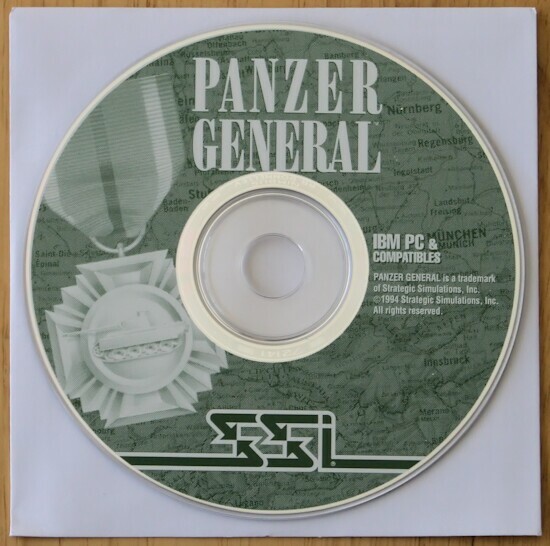 This CD version of the game adds bonuses like authentic video-footage from the WWII archives, and CD quality sound for music and sound effects. Of course, these features are expected in modern games. However, in 1994, such audio/video attention for a wargame was exceptionally rare. The game features animation during the battles. 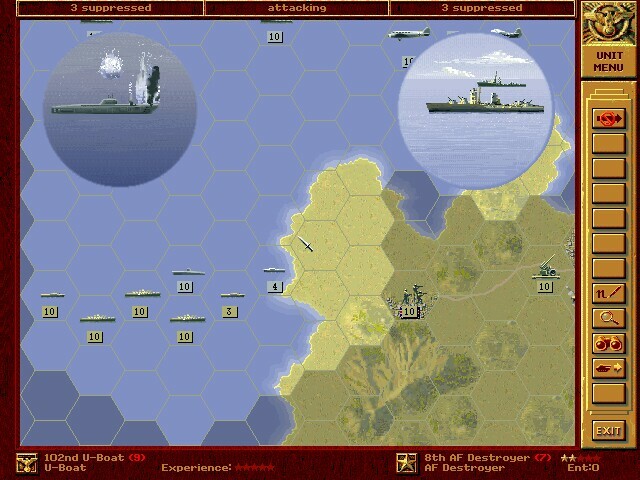 When units attack, two circles appear on the screen showing the units and the landscape, indicating the type of terrain. The explosions are well rendered with fire, plumes of smoke and debris flying from tanks and other terrestrial units. This remains true for the air and naval units. Panzer General is not limited to terrestrial confrontation, it employs all the technology offered by the navies and air foreces at that time. In all, there are more than 350 types of armaments which confront each other on land, sea and air. Right from the start the game offers two possibilities. 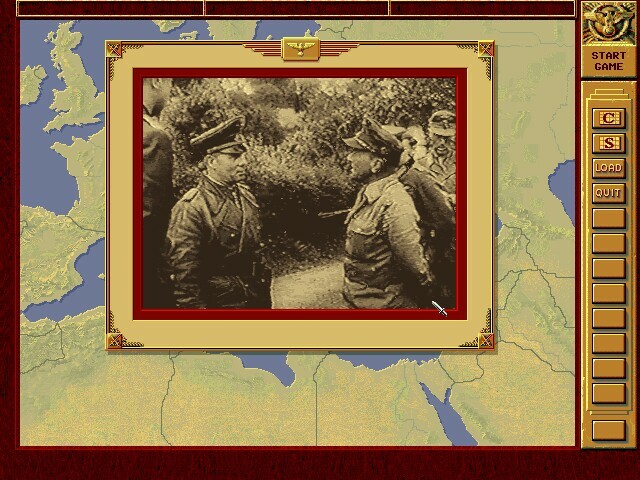 The player can start a campaign as a German general who must prove himself first by seizing Poland in 1939. If victorious, the player can combat on the front of his choice with his victorious armies. Soon, France, Belgium, Norway, North Africa and the Eastern Front will be defeated if the conquering wave continues. This could even reach England and the United States. The second possibility is to chose from 40 different scenarios. Each scenario increases in difficulty and offers a wide range of situations; the result is a game that can eat easily up an entire day. Finally, as in most war games, there exists yet other details that we have not discussed. Among them are the fuel and arms supply for your units, men and material replacement, buying new units, weather forecasts and types of terrain. Panzer General offers vast possibilities that render the game very attractive. Panzer General introduced a new concept to wargames, borrowed from the world of role playing ames: Prestige. The war version of experience points, prestige increases at the same time as your exploits (conquered cities, destruction of enemy units) whereas it decreases when you lose units. It is of great importance because your buying of units, replacements and new equipment for the existing units depend directly on your prestige. You will not be able to carry out an action if the cost of the action is more than your prestige level. If you have never played a wargame because you think they are all boring and impossible to understand, this is the game that will change your mind. If you are a die-hard wargamer, Panzer General may still be an interesting proof of what it takes to draw in a non-wargamer without sacrificing the gist of what makes a wargame fun. A classic even after 15 years.